Q.2 in the text. By the hint I have shown that it has 2 tangent directions. Now how does it follows that there is no submersion? Because $df_p$ sends two linearly independent vectors (which therefore span $\Bbb R^2$) to $0$. Not the answer you're looking for? 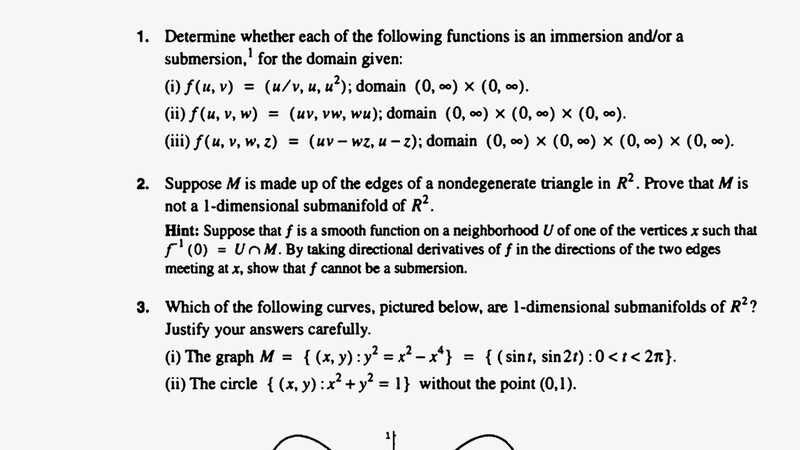 Browse other questions tagged differential-geometry manifolds differential-topology smooth-manifolds exterior-algebra or ask your own question. How does one prove that local diffeomorphism is submersion? What is the “submersion principle?” Showing that $SL_n(R)$ is a submanifold of $GL_n(R)$. The hopf fibration is a submersion.